This month I have been hiding away in a magical music house working on the concert that we will present this Sunday, July 28th at the Horton Community Centre. 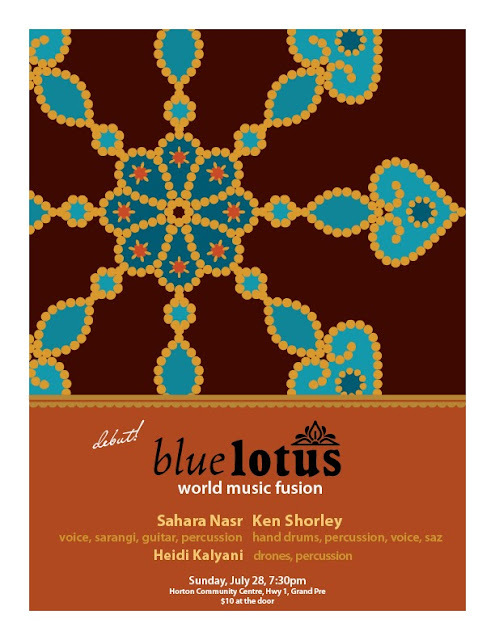 It will be the debut of our group Blue Lotus, consisting of Ken Shorely, Heidi Kalyani and I. We will present an intimate concert of songs and grooves, inspired by our passion for the sounds of India, Afghanistan, Persia and Turkey! We are so excited to finally be putting this project together as we have been talking about it for years and finally, it is the perfect moment! Please come and join us after the days workshops mentioned below. The concert is at 7:30!